I've made two paintings recently that I was curious to see if I could try to edit and make some adjustments in photoshop. To be specific these paintings are; Tropical Illuminati and Galaxy #1. The originals of these paintings can be viewed in my Watercolour Gallery, but as for why I wanted to edit them, well read on. 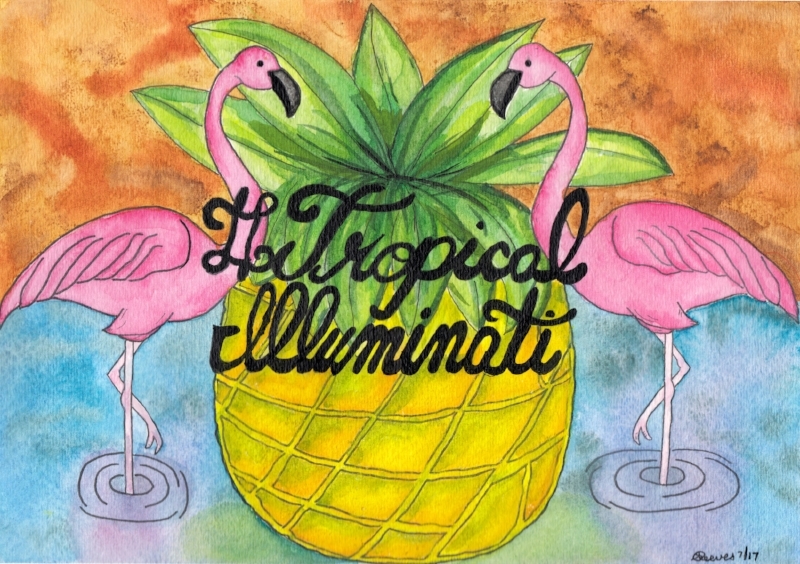 I've written a blog post about Tropical Illuminati which explains the reason behind this particular painting and why I painted Flamingos and Pineapples. I had a ton of fun making this painting, but while I was painting it, in a few spots the water ran way from me which left some of the wrong colour in a few areas, especially in the legs of the flamingos. This is something, that while it bugged me a little bit, wasn't that big of a deal. One of my ideas for the future, is to eventually have prints or cards of the paintings I make. I felt that colour of the water spilling into the legs of the flamingos is something that I wouldn't like to have on a print and I was curious if I could fix this very small mistakes in photoshop. Turns out I can! Even with my very limited skills using photoshop, I was able to do exactly what I wanted to fix the spilled water and a few other minor areas. While I was in photoshop, I punched up the colour just a tad so it was a bit more vibrant. One thing I've noticed now that I have a scanner and have started scanning my watercolour paintings verses taking a photo of them, is that the vibrancy of the colour tends to mute just a little bit more with a scan verses a picture. This was something that I was expecting when doing my research on which scanner to purchase. As you can see, the original and the edited version are just about the same. The main change being on the flamingo's legs, where in the edited version, I removed some of the blue water that had crept into the legs during the painting process. I also "punched" up the colour's in the edited version just a tad. I feel that it still looks like a watercolour painting, just a bit more vibrant. With Galaxy #1, this was the first time that I attempted to paint a galaxy. I kept seeing these lovely galaxy design on Instagram and I was curious if I could recreate on of them myself. I have an idea for another painting that would include a galaxy and I wanted to attempt the galaxy first before I started work on this other painting. The trees are dreadful, and something that I will work on in future renditions of Galaxy paintings. I also found that I left too much blank space at the bottom of the painting, which makes the overall painting fall quite flat and boring I feel. All of that being said, the galaxy portion of the painting, for a first attempt, I'm quite proud of. Galaxy #1 is another painting that I was curious if I could make pop just a bit more using photoshop. At first I just wanted to crop the image, so there would be less blank space at the bottom, but while I had it in photoshop, I also attempted to punch up the colours a bit. As you can see, the edited version of this watercolour galaxy is super vibrant and the colours just pop a lot more than the original scanned version. I debated whether or not to add more stars using photoshop, but decided against it. I've decided that my Watercolour Gallery will always include the original un-edited version (scan) of the painting I've created. While I am enjoying being able to make some minor edits and colour punches to these paintings, they are not the originals. I don't want the original paintings to get lost as these originals are what inspired whatever edits I may make in Photoshop and without them, there wouldn't be any art. In the future, one day, I'd like to have the option to have prints made and I think that photoshop will help with that, punching up the colours a tad will, I believe, translate well to a final printed picture. Only time will tell. What do you think, is using photoshop cheating?